These might be of interest to some looking into aquariums, plastic tank cages, and DIY options for reference. These are some common habitat choices and some others I own or had a chance to measure or have measured for me. All the dimensions are actual INNER dimensions. 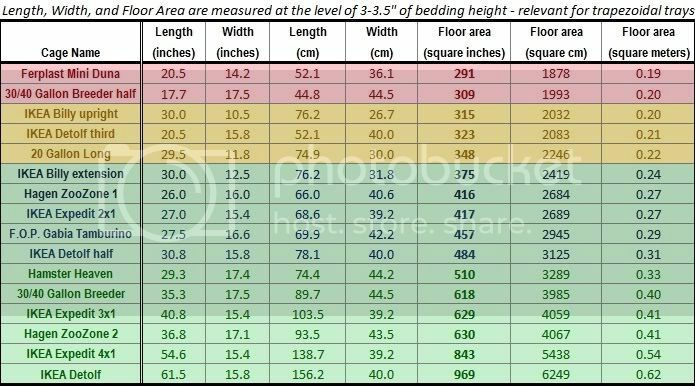 In other words, if a manufacturer states that a ZooZone1 is 27.5" long, the actual length of the cage at a commonly used bedding height is more like 26", because the tray also curves in. A 20 Gallon Long aquarium has fewer than 366 square inches of floor area because of the frame and glass thickness. Etc. I've also added some cages divided into parts, for reintroduction purpose reference (as I've temporarily divided my aquaria before for that reason). IKEA Billy Extension is placed on its back side and an IKEA Billy glass shelf is glued with silicone to make the front glass panel. A homemade lid is then added. IKEA Billy "upright" is a regular IKEA Billy case with glass doors, where additional glass rectangles are inserted to keep bedding from falling out when doors are opened. A ZooZone 2 with 3 inches of bedding gives a 43.5cm x 93.5cm floor area, which is ~4067 square centimeters of usable floor space. I used approximately 3"-4" of bedding for ZZ1, F.O.P. Gabia Tamburino, and Ferplast Mini Duna calculations as well. IKEA Expedit here is a 2x4 or 2x2 shelf, where each of the 2-cube rows is used to make a cage (up to 4 or 2 cages, one on top of another). For reference for European members, 1" is 2.54cm long. Last edited by Hamtastic; 11-18-2012 at 09:01 PM. Very useful info thanks. I will sticky this. Added dimensions in centimeters for European members. Clarified IKEA Expedit cages: they are now listed in dimensions of "cubes" they take up, e.g. "2 cubes by 1 cube". Thanks to everyone who helped with measurements of cages I do not own myself. Er... If the NHC do say that its not a number this forum generally agrees with. 1000 square cm is only 25cm by 40cm and thats really, really small. As a general rule the minimum for a syrian should be roughly 4000 square cm.